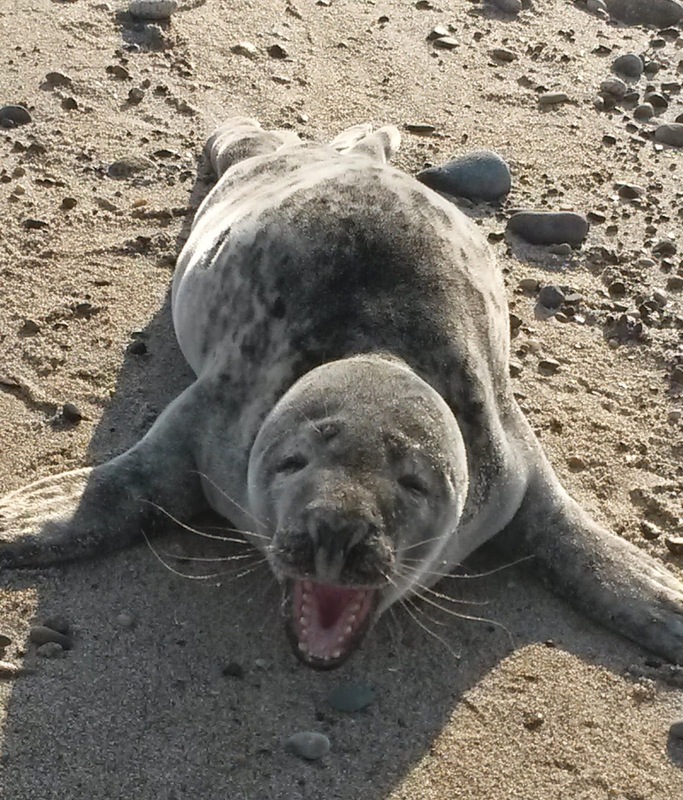 A seal is on the beach: Who do you call? Please note: It is normal for seals to rest out of the water! Guest Bloggers and in-house volunteers Emily and Melissa were the main contributors to this blog. It is summertime in New England, which means more interactions between seals and people as the beaches fill up with swimmers and sunbathers. Harbor seals and gray seals are our year-round, native species, and they will rest on the beach to warm up after foraging in the cooler water. The majority of seals seen on the beaches are usually less than one year old. They tend to be thinner because they have weaned from their mothers and are still building up body fat. Due to their young age they tend to be naive to good haul out locations and feeding grounds. The New England Aquarium’s response area ranges from Salem, MA, to Plymouth, MA. 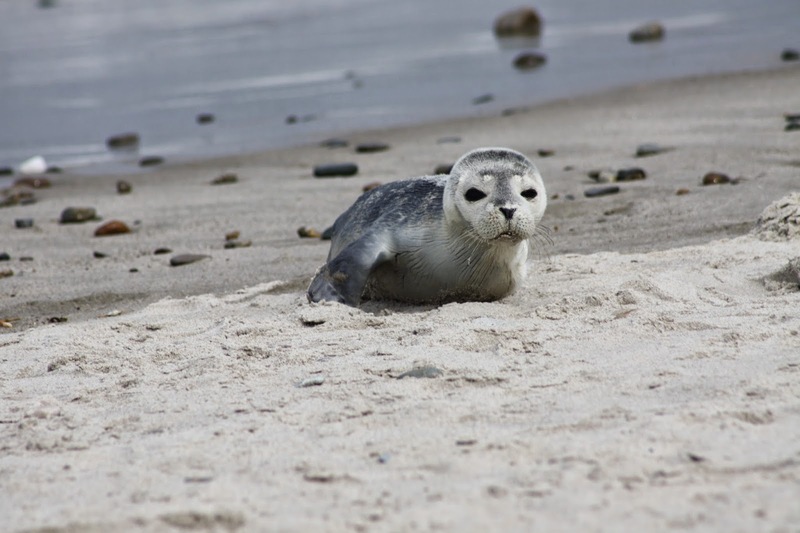 If you encounter a seal on the beach within this territory, please call our Marine Mammal and Sea Turtle Hotline at 617-973-5247. This number can also direct you to other marine mammal hotlines in New England by choosing the correct option. However to reach a specific marine mammal stranding response agency we have listed geographic areas with the corresponding agency below. 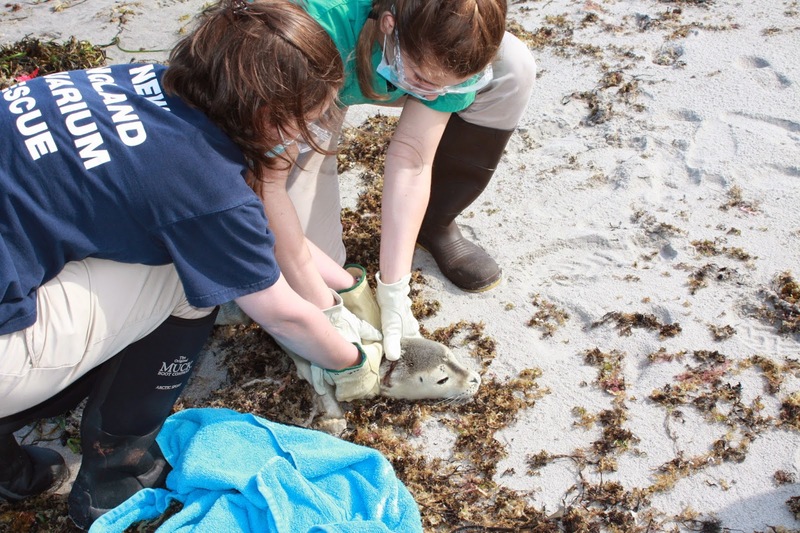 Every seal reported within New England Aquarium’s territory will be monitored by the staff and trained field volunteers. Not every seal that is reported will need to be brought to a facility for rehabilitation. This harbor seal is in a normal resting position called the “banana posture.” Based on the photo, there are no concerns about the health of this seal. Here is another photo of a harbor seal resting on the beach. You can see that he is thinner than the previous seal. One common concern is that the seal is a baby that should still be with his mother, but they only nurse for approximately 4 weeks before they are weaned. 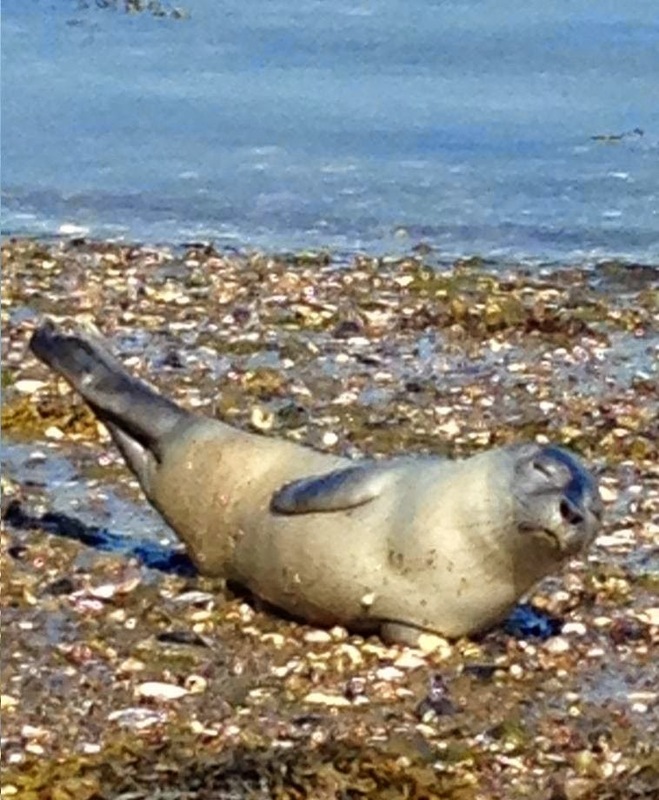 This seal is independent and may have just started learning how to forage for fish. This harbor seal is looking at the photographer. This means that the photographer is too close since the seal has been alerted by his or her presence. This seal is thin like the previous seal, but you can see between the rear flippers and in the sand that she has defecated recently, indicating successful foraging. Here is a gray seal in good body condition. The photographer here is too close since the seal’s mouth is open. Seals can and will bite if they feel threatened. They can also carry diseases that can be easily transmitted to dogs, as well as humans. 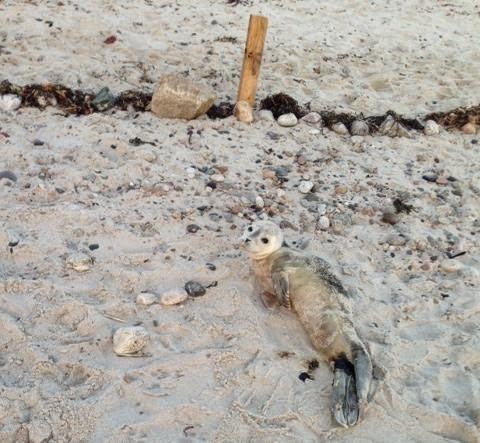 This is one of many reasons to keep your distance from a seal resting on the beach. This gray seal is not being shy but is in fact stressed by the presence of the photographer. Seals will wave a flipper, scratch their head or cover their eyes if they are feeling stressed. Seals will also shiver if they are being stressed. You do not want to put a blanket on a shivering seal. It may appear cold, but seals can overheat and die if they are covered. 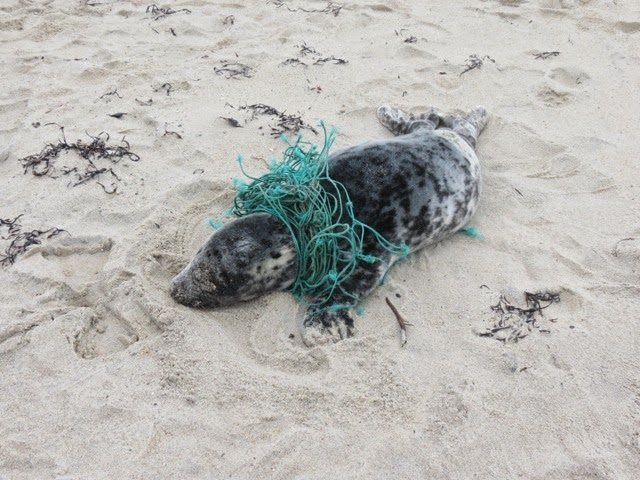 This gray seal would warrant an immediate field response as it is entangled with marine debris around his neck. 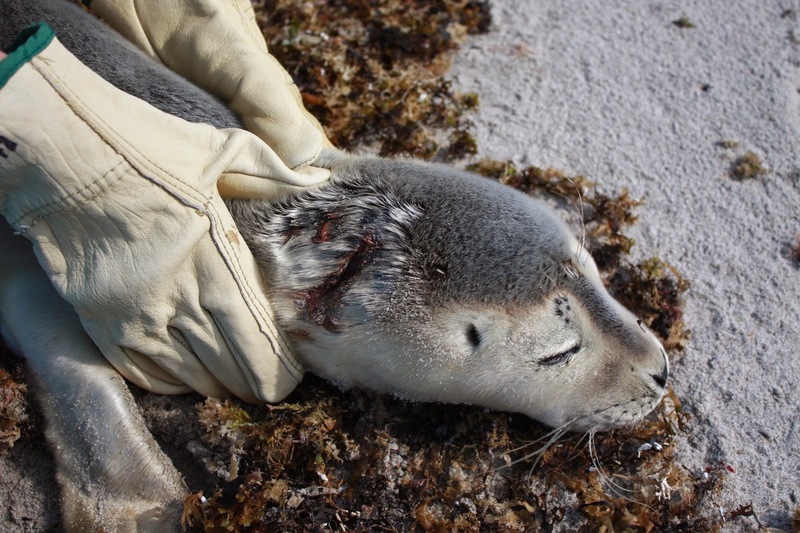 This harbor seal has a wound on his head that also warranted an immediate field response. Note that the New England Aquarium response team is wearing leather gloves, eye protection, and a face mask due to the diseases that can be transferred between seals and people.